Dooley Chapman, George Bennett, Con Klippel, Jim Harrison, Charlie Ordish, Fred Holland, Clem O'Neal, Susan Colley, Ernie James, Percy Yarnold. Mary Ann Carolan, Ella Mae O'Dwyer, Katey Hourican, Terry Teahan, Stack Ryan , Jim Droney, Martin Howley. Elizabeth Crotty. William Mullaly, Michael Doyle, Patrick Flanagan, Tom Barry. William Kimber , Scan Tester, Ellis Marshall , Fred Kilroy , Eric Holland , Bill Link. Faan Harris, Chris Chomse , Kerrie Bornman, Hans Bodenstein, Willie Palm, Pietie Prinsloo, Silver de Lange. Australia: Ian Simpson, Ray Simpson, Keith Klippel, Peter Ellis, Dave de Hugard England: Will Duke, Dave Prebble, Harry Scurfield; Ireland: Sean O'Dwyer; South Africa: Stephaan van Zyl. Dan Worrall is becoming a bit of a one-man publishing industry on the history of the anglo-concertina. I've previously reviewed for this magazine The Anglo Concertina Music of William Kimber (2005) and his two-volume The Anglo-German Concertina: A Social History (2009). This new publication follows on from, and develops some of the themes covered in, the latter work. In that global survey he posited that anglo players in widely dispersed geographical areas developed remarkably similar playing styles, because of the similar conditions in which they found themselves i.e. they were functional musicians playing for dancing, unamplified and often solo, and needed to produce as much volume as possible in order to be heard by the dancers. In this latest study he focuses on 'musicians who played German and Anglo-German concertinas in Australia, England, Ireland, and South Africa during the latter part of the heyday of the instrument, which occurred from the 1860s to about 1920, at a time when social dances held in houses, woolsheds, and barns provided a very popular pastime for people in working class urban, rural and frontier areas.' And, thanks to the CD-ROM format, he is able to include, alongside the text, sound files presenting musical examples from thirty four musicians from the four countries listed. Thus we are able to hear, for example, in support of Worrall's argument, Scan Tester from Sussex and Dooley Chapman from New South Wales playing the same tune, and in a remarkably similar style. Worrall describes the settings for dances in this period - barns, woolsheds, private houses, crossroads and so on - and shows how they provided broadly comparable environments for both dancers and musicians. The dances enjoyed at these functions in different parts of the world were also of a type: mainly ballroom dances such as quadrilles, waltzes, polkas and schottisches, rather than longways and other 'country dance' forms. In Chapter 4 there's a useful breakdown of these dance forms, illustrated, as throughout the work, by musical examples drawn from any of the four societies under investigation. The tunes used for these dances were of course also often international. Thus one finds variants of the same tune across the globe (the tunes used for the Varsoviana provide a classic example of this, along with popular song tunes such as Dan Tucker, All Smiles Tonight or Two Little Girls in Blue). And even with tunes which are only known from one locality, they clearly fall within certain types - schottisches from England, South Africa and Australia are all definably schottisches, for example (ditto Ireland, although there the dance tended to be known as a highland or fling). 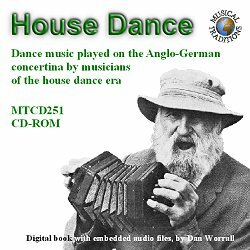 Playing similar tunes for the same dances in similar settings, on similar instruments (typically cheap German or Anglo-German concertinas), musicians not surprisingly developed similar ways of playing their instruments. In some cases they played just a single note melody, but more often - if only because it produced greater volume and a fuller sound - they seem to have played the tune on each hand, an octave apart. This is the style English readers will associate most readily with Scan Tester, but here you will find plentiful examples from Australia (including Dooley Chapman, Con Klippel, Fred Holland), Ireland (Mary Ann Carolan, Bernard O'Sullivan) and the Boers of South Africa (Chris Chomse, Hans Bodenstein). Worrall provides detailed notes on each player, including information on where and when they played - in many cases using the musician's own words - and what they played: whether they played a German or Anglo-German concertina, whether it was a 20 or 30-key instrument, and what keys it played in. The author then gives an analysis, and often a transcription, of the musical examples included on the CD-ROM. This analysis tells you whether the player played a single note style, in octaves, or with chording (or some combination of these); and whether they played straight up and down the rows, or in a cross-row style. Ella Mae O'Dwyer, from County Limerick, for instance, is described as playing one of her tunes thus: "She starts the tune on the lower row (F), then moves up to the upper (Bb) row, and then weaves the tune back and forth the two rows. Every convenient note is played in octaves; only the quicker or inconvenient parts are played singly." Some of the finer points of these descriptions may be lost on readers who are not anglo players, but I think anyone likely to read this work will be able to grasp the gist of Worrall's descriptions - especially since in every case you can listen to the tune under discussion being played. Indeed I think most readers will find that the author's descriptions allow them better to appreciate and make sense of the musical examples: why does Mary Ann Carolan sound like she's playing a one-row melodeon? because she is playing on 'a C/G German concertina that had double banks of reeds tuned an octave apart, which meant that when playing in octaves she was sounding four reeds for each melody note'; how does Faan Harris achieve that very full, chromatic, sometimes syncopated sound? well, he has an impressive technique, but actually his style is still very much based on playing in octaves. Worrall is also good at relating musical style to external factors: the availability of superior instruments enabling Boer concertinists, and some English players such as Fred Kilroy, to develop a more sophisticated style; or the influence of nationalist and religious dogma on the decline of ballroom dances (and their accompanying tunes and style of playing) in Ireland. He devotes a significant amount of text to the Irish situation - an unusual one after all, where pressure from church and state, rather than just changes in musical fashion, brought about dramatic changes in musical style (and, as a by-product, almost killed off the anglo-concertina). He is able to demonstrate and explain the clear differences between players such as Mary Ann Carolan who retained the old 'House Dance' style of playing, and those like Elizabeth Crotty who (although actually older than Mrs Carolan) adapted to the changed circumstances and played in a 'ceili dance' style. For anyone interested in the history of Irish traditional music, the recordings presented here of these 'lost' dance forms are essential listening. And while these old ballroom-style tunes may lack the excitement of a fast Irish reel, it is abundantly clear from the musical examples presented here that there is still plenty to admire in them, and those who played them. Indeed, English musicians like me who play in functional social dance bands will probably find it much easier to relate to these tunes: they are tunes not just to admire, but which one can imagine actually playing at a Saturday night dance. Most people today, if asked to exemplify the differences in English and Irish anglo-concertina styles, would probably think of players such as John Kirkpatrick and Noel Hill - each of whom plays the same instrument in a very different way. But listening to the musical examples here you can see that English and Irish styles were not always so different - nor so different from playing styles on the opposite side of the world. I intend no slur on Dan Worrall's writing style, or the research which underpins it, by saying that you could in fact regard his text as merely extensive sleeve notes: you may consider that this CD-ROM is worth buying for the audio files alone. These number almost 200: 69 from Australia, 37 from England, 54 from Ireland, and 33 from South Africa. They range in date from a 1927 Victor 78rpm record of William Mullaly, through to private recordings of Mary Ann Carolan made in the 1980s. There are some recordings here which are commercially available, on Topic and elsewhere, but the majority are either hard to come by, or simply have not been available before. For readers outside South Africa this certainly applies to the recordings of Boer concertina-players from the 1930s. And there's actually some pretty rare stuff among the English recordings too - the recordings of Ellis Marshall, Eric Holland and Bill Link are all from private sources, while even the majority of the William Kimber tracks, from the Peter Kennedy archive, are currently unavailable elsewhere (although we can hope that this will be remedied by a future Voice of the People release, perhaps). While the recordings do support Dan Worrall's central argument that musicians from different cultures tended to play in a broadly similar style, they also, naturally, demonstrate that there were regional styles, and variations between players within a society. The paucity of recordings of English anglo players makes it dangerous to draw conclusions about an English style, although it was more likely typified by Scan Tester than William Kimber. Here we have the same cross-row octave style employed for North West morris tunes by Ellis Marshall and Norman Coleman, and by Eric Holland from Swanage, Dorset on tunes such as Waltzing Matilda and Ave Maria. Holland provides a rare known example of an English anglo player who existed completely outside the folk scene, and in the post-war world 'found themselves playing easy listening music in pubs and for coach trips of holidaymakers' (in some ways not dissimilar to what Scan Tester was doing, before he was embraced by the folk revival, except that Scan was always very much a dance musician). Bill Link from Essex is another in this category (and another player I had never heard before) but he used a much more heavily-chorded style, as did the better-known Fred Kilroy from Lancashire. Kilroy's style is not dissimilar to that employed by Boer musicians who developed the basic octave style into a much more sophisticated approach. In fact the Boer recordings here probably sound least like those from the other societies under discussion, although that is at least partly attributable to the fact that these South African recordings are mainly taken from commercial 78s, and feature ensembles such as Die Vier Transvalers and Die Vyf Vastrappers, rather than solo performers. Finally I must mention that, for any anglo players out there who fancy playing in octaves, but don't know where to start, Dan Worrall has provided a tutorial (with on-screen examples and accompanying audio files) which should get you on the right road.